The City of Eugene has 240 traffic signals. The 197 traffic signals indicated by green dots on the traffic signal map are connected to the City's traffic signal computer system using city-owned interconnect cables that are underground in some areas and overhead on utility poles in other areas. Our ultimate plans are to have all city maintained traffic signals connected to the central computer. Malfunctioning traffic signals are more quickly detected and the problem assessed if they are connected to the central system. In addition, new traffic signal timing plans can be downloaded from the central office to the traffic signals. When new timing plans are developed for signals not connected to the computer, crews must enter the timing data at the traffic signal controller box located at the intersection. 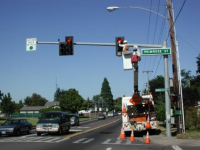 For more information about Eugene's traffic signal system, download a traffic signal fact sheet. To report a malfunction of a traffic signal, please call 541-682-4800 or call 9-1-1 after business hours.